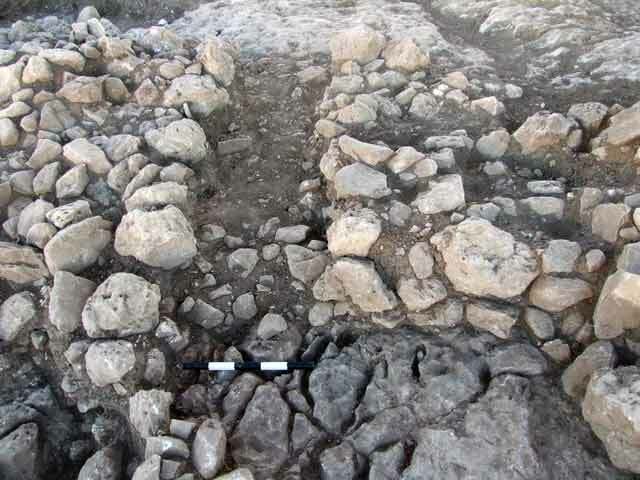 During February–November 2010, an excavation was conducted along the fringes and west of the Bet-Ha‘Emeq antiquities site (Permit No. A-5830; map ref. 215078–467/764015–250), prior to the construction of a residential neighborhood and in the wake of a survey performed by Y. Lerer in July 2009. The excavation, undertaken on behalf of the Israel Antiquities Authority and underwritten by the Ministry of Construction and Housing, was directed by Y. Gur and N. Getzov, with the assistance of Y. Ya‘aqobi, Y. Lavan and H. Az e-Din (administration), R. Mishayev, Y. Nemichnitzer and M. Kahan (surveying), A. Shapiro (GPS), M. Hartal (guidance), and the Sky View Company (aerial photography). The site was discovered by R. Frankel in 1973 and an excavation was conducted (Givon S. 1993. The Excavation at Bet-Ha‘emeq. 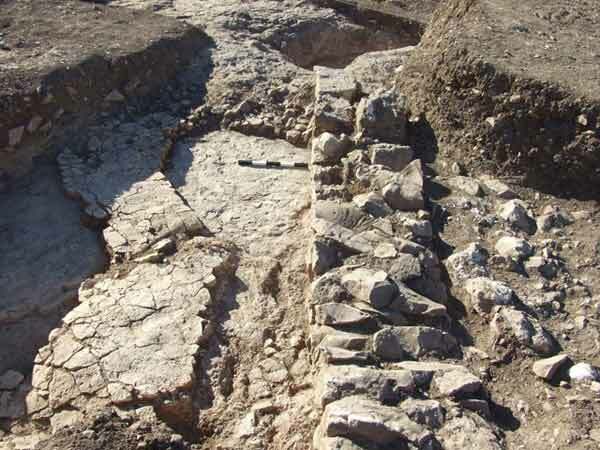 Tel Aviv), revealing strata that were ascribed to the Late Chalcolithic period, Early Bronze Age I–II and the Persian period. Five burial caves were excavated west of the site in 1992 (‘Atiqot 33:47–60 [Hebrew}; 42:35–78). 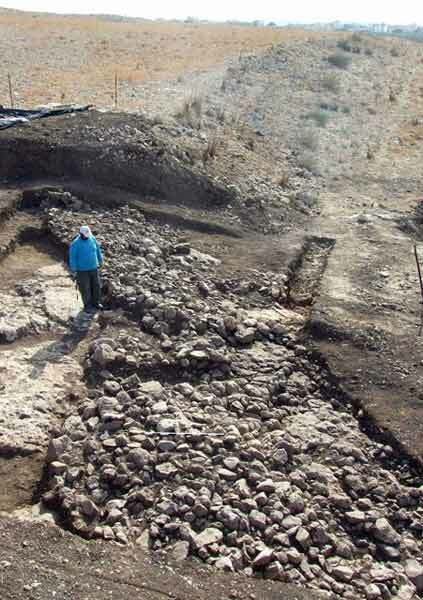 The current excavation extended across two sides of a valley that runs between the settlement Asherat and the Bet-Ha-‘Emeq antiquities site and connects to Nahal Zakh. Three areas (A–C) were opened. Seventeen installations were excavated and examined in Area A, on a spur and southern slope west of the Bet-Ha-‘Emeq site; two sub-areas (c. 120 sq m) were opened in Area B, on the western slope of Bet-Ha-‘Emeq site; and in Area C (c. 50 sq m), on the spur west of the Bet-Ha-‘Emeq site, two strata were identified. Three simple winepresses, six quarries and eight tethering installations were exposed. The winepresses (Fig. 1) that partly made use of the natural bedrock and others were meticulously hewn consisted of treading floors and collecting vats. The quarries were used for hewing ashlars. Rectangular stones (length in excess of 3 m) were cut in two of them. A stone that had been damaged during the rock-cutting process was left in place in one of the quarries and a negative of a stone remained in another quarry. Stone piers (betulot) used in olive presses were evidently hewn in one of the quarries (Fig. 2). Such stones were utilized to secure olive-press beams in the Western Galilee during the Roman period; many installations of this type are known and the quarries for these stones have been identified here for the first time. 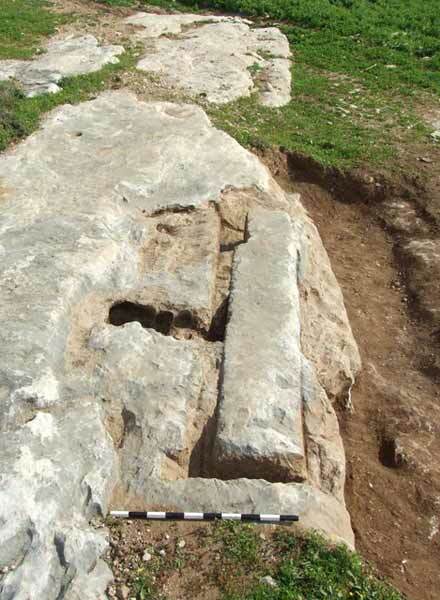 Circular stones that were used for various installations of olive presses were produced in other quarries found in the survey in the vicinity of the site. The survey findings therefore show that the inhabitants of ancient ‘Amqa specialized in the installation of olive presses. 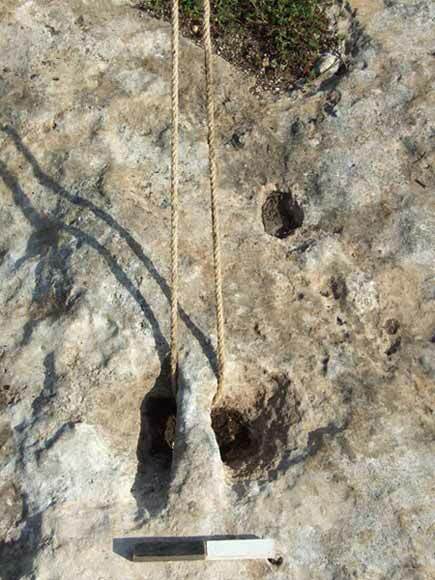 The eight tethering installations consist of small ‘bridges’ hewn in the bedrock that were apparently intended for tying ropes (Fig. 3). A similar find was discovered at Midrakh ‘Oz (HA-ESI 121). The base of a wall (length c. 15 m, width 3 m; Fig. 4), aligned north–south, was exposed on the bedrock surface in the eastern part of the site. Small stones were used in its construction and a few medium-sized stones were placed along the edges. A narrow postern (width c. 0.7 m: Fig. 5), extending across the width of the wall, was exposed. A bedrock outcrop with no other architectural remains was next to and east and west of the wall. Overlying the wall was an accumulation of reddish brown earth (thickness c. 0.8 m) on whose surface was a heap of stones that had probably been piled up by farmers. A probe trench (length 30 m, width 2.5 m) was excavated along the western slope; it was ascertained that no additional remains existed, other than an accumulation of numerous potsherds c. 6 m from the wall. Most of the potsherds in the accumulation above the wall, on the bedrock surface near it and in the trench excavated across it dated to Early Bronze Age II. The potsherds found on the bedrock surface outside the wall were ascribed to Early Bronze Age I. 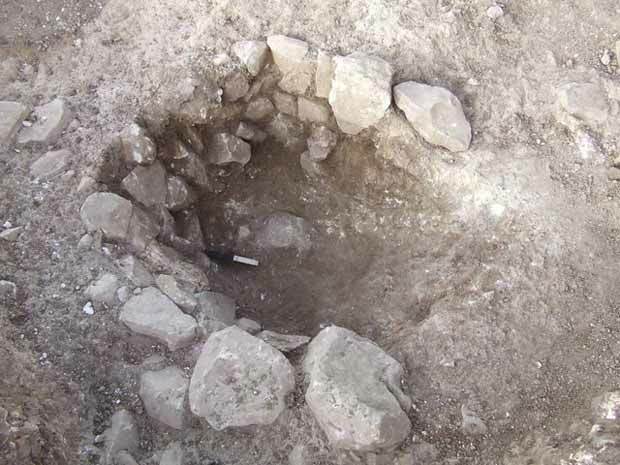 A small probe (2 × 7 m) was excavated in the western part of the area; remains that dated to the Late Chalcolithic period were discovered. The stratum included a fieldstone floor, a pit lined with small stones and a wall (width c. 0.6 m; Fig. 6). Numerous potsherds characteristic of the period were found. Two strata were identified on a terrace in the middle of the slope of Area A.
Stratum 2. A stone surface founded on reddish brown earth, overlying the bedrock base (yellow gray clayish chalk). The surface was inclined from south to north, opposite the direction of the slope, and it abutted a line of medium and large stones in the south that served as a boundary between the surface and the bedrock base. Stratum 1. A surface of small fieldstones, also sloping from south to north, was founded on reddish brown soil that contained many potsherds. A pit lined and paved with medium-sized stones was found in the southwestern corner of the area (Fig. 7). The pit was dug into Stratum 2 and damaged its southern line of stones. Some of the stones were used to line the pit. Most of the pottery vessels in Area C dated to the Late Chalcolithic period and EB I. It was not possible to date the strata with certainty, due to the grade of the area. 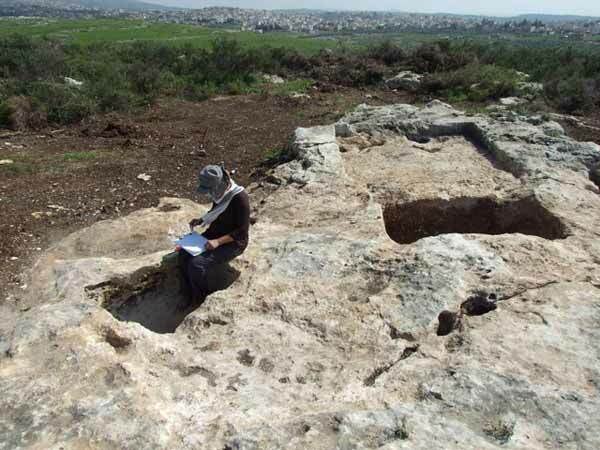 The finds from the current and past excavations at the Bet-Ha‘Emeq site show that the settlement in the Chalcolithic period extended across an area of dozens of dunams and included the tell, the valley and the spur west of the tell. The settlement expanded further in EB I and EB II; it was surrounded with a wall and no indication was found to any habitation outside the precincts of the tell. Activity dating to the Roman and Byzantine periods, which is characteristic of the rural periphery and includes burial in caves, quarries, cultivation and agricultural industry, was evident as well. A special find are the quarries where olive press piers (betulot) were probably hewn. 1. Area A, two winepresses, the settlement of Abu Senan in the background, looking south. 2. Area A, a quarry where olive press piers (betulot) were hewn, looking southwest. 3. Area A, a tethering installation, looking north. 4. Area B, the wall, looking south. 5. Area B, the postern in the wall, looking east. 6. Area B, the wall dating to the Chalcolithic period, looking west. 7. Area C, the lined pit, view from above.